During the USA-Jamaica senior team friendly, you may have noticed USA right back Graham Zusi being destroyed for pace by the Jamaica No. 11 11 shirt. That was Bethlehem Steel FC striker Cory Burke. The 25 year-old center forward was bought by the Steel last November after having played the 2016 season on loan from Rivoli United FC of Jamaica’s Red Stripe League. 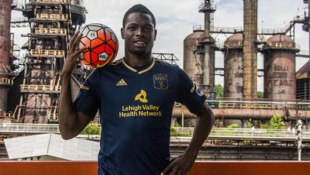 After recovering from a meniscus tear suffered while with the Jamaica national side in February 2016, Burke started 14 games, appeared in six more and played 1,226 minutes for the Steel. He scored four goals and provided two assists from 42 shots, 16 of which were on goal. Once he recovered game fitness sufficient to start, he was the first choice striker for the rest of the season when healthy, with one exception. Burke plays as a classic English-style number 9, doing so in the fashion preferred by Union head coach Jim Curtin as a two-way player pressuring opposing center backs and defensive central midfielders. He contests tall-tree opposing center backs for aerial balls very well. He holds the ball at his feet successfully while under pressure from behind, waiting for teammates to deploy forward. He made clear progress developing the endurance necessary to play the game North American-style and as a defending striker. He plays hurt with full effort, setting a strong example for his younger fellow strikers. Burke scored the game-winning lone goal away to Charlotte early last June in the first of a month-long series of summer road trips, a highlight for both the player and his team. Burke lacks poise in the box under pressure, often overhitting his shots and assist opportunities. Only a quarter of his shots were on frame, and many potential assists were delivered too hot to handle. His endurance was still not USL 90 minutes fit as of last September. To his credit, he seems to leave everything he has on the field. In the aforementioned national team friendly he lasted well past the 75 minute mark, suggesting some fitness improvement. Staying healthy during preseason will help. Additionally, Burke needs a better sense of when to check back for the ball to combine with his offensive midfielders, both central and flank. Against Pittsburgh at Goodman late in the season — a game that had to be won in order preserve the possibility of playoffs — he had come back defensively to help on an early corner kick and made the initial play. But in following up, he fouled inside the box. The Pittsburgh penalty kick denied the Steel any further playoff opportunity. One suspects the low point serves Burke as motivation moving forward. He is not currently thought ready for a chance with the Union, if the quantity of the first team’s off-season front-line acquisitions is any indicator. However, judging from the evidence now available, he is still the organization’s second classic English-style number 9. The recent Union’s front-line acquisitions emphasize speed and possession rather than the direct aerial game down route one. A productive 2017 with the Steel could earn first team consideration in the future. Further good work with the Jamaican national team would also help. For now, Burke is the presumptive starting striker with the Steel. Have to say I was impressed with him in the USA-Jamaica friendly. He fought for everything and made himself a real nuisance to the US defense. Honestly, he showed better in that game than either Pontius or Bedoya. A little bit of apples and oranges, but seriously! Dude showed speed for sure, completely blew by Graham Zusi (who isn’t the fastest) but really showed that he can be a threat. Hopefully he stays healthy and opens up for Steel FC this season! For me the key is getting a higher percentage of shots on frame. In some ways he may be trying too hard, relying too much on the supreme effort rather than being like ice when under pressure. Here’s hoping knowing what to expect will ease his way to real improvement.